Dominic Green has written a truly weird but entertaining novel. Well, this is actually more of a collection of several short stories bound together by a running theme and cast of characters. And throughout the stories, he takes unceasingly and rather funny potshots at aspects of our modern society to include, but not be limited to: religion, the wealthy, the government, big business, the military, the environment, the criminal justice system, tax collectors, criminals (sometimes one and the same as tax collectors), and any other target of opportunity. To be honest, I am still not quite sure on why he chose the setting, a small, 20 km long world. But sometimes a reader just has to go with the flow and enjoy the ride. Despite the book's title, the setting is not vital to the storyline. The Reborn-in-Jesus family is a hoot, from the patriarch Mr. Reborn-in-Jesus, his no-nonsense wife, Shun-Company, to their many blood and adoptive children such as Beguiled-Of-The-Serpeant, Pitch-Not-Thy-Tent-Towards-Sodom, and Be-Not-Unto-Man-In-Thy-Time-Of-Uncleanliness. With their goats and mutated crops, they manage to survive the various obstacles thrown their way, though usually with the assistance of the enigmatic Uncle Anchorite, a mysterious if powerful hermit. From barely surviving on a new world to becoming stockholders in a growing business empire, the family interacts with the various people who arrive on their world. And that gives the author plenty of opportunity to load up and sling his stones in all directions. I laughed out loud on more than one occasion, eliciting some strange looks from others sharing my flight from Shanghai to Bangkok. This is a pretty quirky book, funny, clever, and yet more than a little thought-provoking, as goods satires usually are. I recommend picking it up and giving it a try. 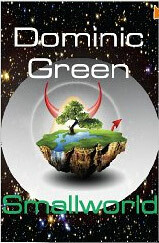 For more reviews or to buy Smallworld from Amazon.com, click here.